The aesthetics of nature has over the last few decades become an intense focus of philosophical reflection, as it has been ever more widely recognised that it is not a mere appendage to the aesthetics of art. Just as nature offers aesthetic experiences beyond the reach of art, so the aesthetics of nature raises issues not contained within the philosophy of art. Malcolm Budd presents four interlinked essays addressing all the main problems about the aesthetics of nature. These include: how the aesthetic appreciation of nature should be understood; the character of an aesthetic response to nature; what kinds of aesthetic experience nature affords and what kinds of aesthetic judgement it is amenable to; the aesthetic significance of intrusions by humanity into nature; whether aesthetic judgements about nature can be objectively true; the doctrine ofpositive aesthetics with respect to nature; the aesthetic significance of knowledge of nature and in particular whether scientific knowledge is necessary for serious aesthetic appreciation of nature; and the correct model for the appropriate aesthetic appreciation of nature. 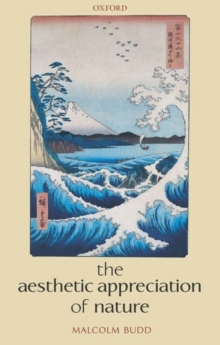 The Aesthetic Appreciation of Nature also includes a comprehensive exposition and examination of the thoughts of the greatest philosopher to make a substantial contribution to the subject, Immanuel Kant, and an encyclopaedic critical survey of much of the most significant recent literature. Scholars and students of aesthetics will find valuable resources here, and much to think about.